Poor old Ukraine obviously needs a laugh. It is not uncommon to find iRaspberry increase in places where life is looking a bit grim. 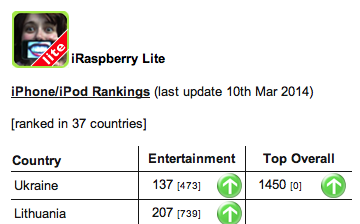 Two of our apps, "iRaspberry" and 'hellozoo' remain consistently in the Top 100 paid Apps in the Entertainment category on the Amazon Appstore. Gotta love that store!